How to use this card now that Frost Lich Jaina is so prevalent? But look at their location... is it like a centaur thing? I always thought it was a humanoid, now I have an existential crisis. This is ridiculous in arena. I think the thing that makes it so strong is it allows you to smorc. I've won so many games I shouldn't have because this guy's little 1/1 taunt allowed me to go deal face damage or trade greedily. It should at least be an epic. Love its effect! Can get really annoying for the opponent (though Priest's Holy Nova makes it easier). 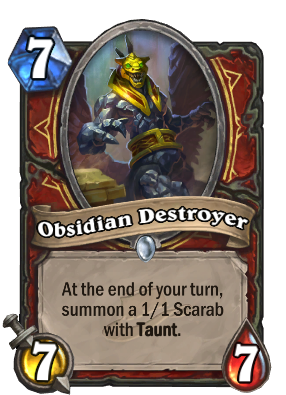 Flavor-wise, can I ask why this summons Scarabs instead of statues or golems? 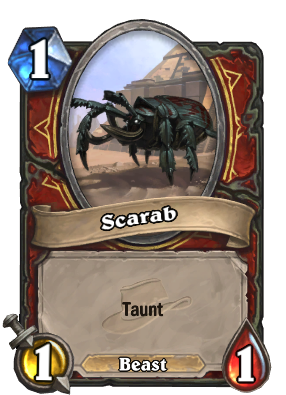 It is an Egyptian themed card, not Greek or Roman, so scarabs seem appropriate. BUT IN ARENA ITS PREEEEETTY GOOD! All hail Kripparian the arena god! Okay, sure, it's not amazing in Constructed, but it's a much-needed card for Arena. This expansion gave Warriors two good Common minions. I've heard a lot of negative things about this card. It's been winning me games.